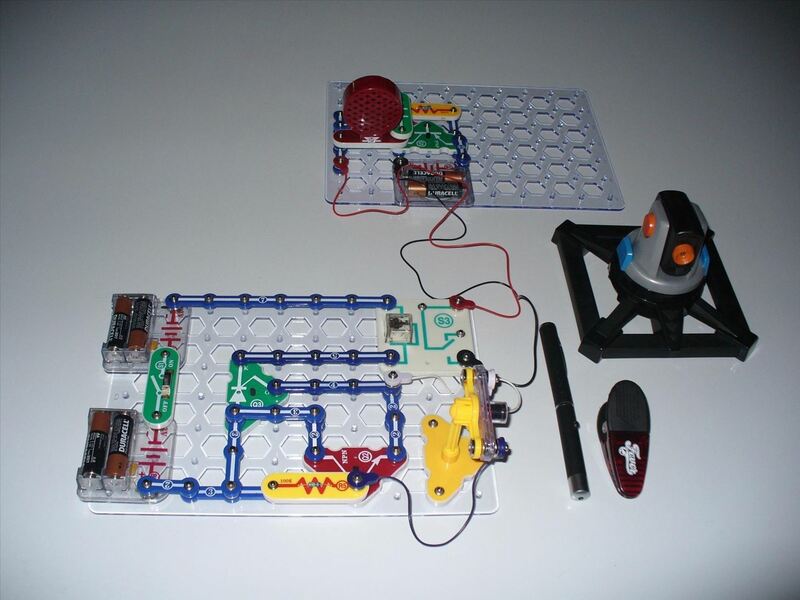 Want to learn how to build a laser tripwire and alarm out of snap circuits? I'll show you how to build both circuits— the laser tripwire circuit and the alarm circuit. The alarm is a very simple two-transistor oscillator that is switched on by the relay in the laser tripwire circuit. Once you have built the two circuits, you will then need to set up the laser pointer where someone is likely to break the laser beam and trip the alarm. The Spynet Laser Tripwire system was the inspiration for this build. I wanted to see if I could build my own laser tripwire. I also improved on it by adding the relay to switch on an external circuit. I used the two-transistor oscillator as an example, but one could use the relay to switch on any number of external circuits such as floodlights, home alarm systems, etc. For a complete step-by-step build of the laser tripwire and alarm, visit my project on Make.